I discovered Michael Moorcock’s work fairly late in life. I’d just started teaching in Higher Education and was pointed towards both Elric of Melibone and his academic text – Wizardry and Wild Romance. The latter I found disagreeable, but deeply insightful and the former a read I could begin but not finish, no matter how hard I tried. 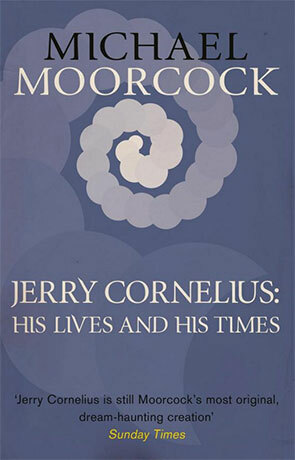 Eleven years later, I return to try again with Jerry Cornelius: His Lives and His Times, a collection of Moorcock’s short stories about this particular character. The introduction to this special collection edition of the work by John Clute is effusive and deeply respectful. Moorcock’s own introduction after this is introspective and ruminant as he recounts the ideas and process that has shaped many decades of his writing. Cornelius represents his voice, he tells us, and is probably my most successful attempt at unconventional fiction. Jerry Cornelius is a time travelling adventurer, constantly engaged in correcting anomalies and thwarting the agendas of others. He traipses through Moorcock’s alternative realities, loving, murdering, betraying and more. Characters swap around constantly, a few as persistent troublemakers or allies, others as resigned casualties to the various future tech weapons he employs. By all accounts, the longer novels and novellas offer a more in depth account of his longer adventures. This collection, spanning a writing career of forty five years, lives up to the tag of unconventional. My first impression is of written smoke, or fragments thrown on a page. The words make sense, the ideas are coherent and purposeful, but there is no feeling of substance, a substantial contrast to the dense text of the introduction. From what text there is, we get a sense of character reverence, much like Moorcock’s earlier character – Elric, but the story is broken into tiny scenes, none long enough to let us share in the author’s worship. Both Elric and Cornelius come across as intellectual and disaffected, there is a languidity to them, a sense that they are above the scenes they find themselves in. From The Murderer’s Song (1981), the prose does get a little thicker and easier to grasp. The arrival of Una Perrson as a cynical second perspective does help with this, allowing us to see Cornelius as she sees him. For the relaxed reader, Life and Times is something to dip in and out of. The stories wash past at a decent pace and the character is certainly varied and memorable. Much of the writing is an exercise in defamiliarisation – blended sentences that provoke curiosity, but never really provide substantial answers. For a writer, this is a masterclass of isolated technique, but not a deep, immersive or cathartic experience. I feel like a spy, allowed to look in on the adventures of Moorcock’s chrononauts, glimpsing their colourful interplay as each adventure winds towards its madcap conclusion. Try to pin anything down though and you find yourself reading and re-reading to make the connections and still feeling frustrated that there’s something you’re missing. For fans, Jerry Cornelius: His Lives and His Times is an essential companion work to the longer stories. Moorcock’s play on contemporary references (of the time) lined with the fantastical, makes for a quite a history project and social comment. Other readers approaching Moorcock’s work at its time of release or as an exercise in the development of speculative fiction genre will have much to treasure from this collection. There are many experiments with content, genre, technology and style that have inspired other writers since. The vast array of Moorcock’s work is interconnected through a myriad of ideas and postulations. John Davey’s work with Moorcock to structure this into the Eternal Champion series provides the most coherent reading order of the major works, so if these short stories wet your appetites for more, this should be your next step. Written on 1st August 2014 by Allen Stroud.